"Fishers Island" redirects here. For the island in Nunavut, see Fishers Island (Nunavut). For other uses, see Fisher Island (disambiguation). Flat Hammock Island is located east of South Dumpling Island. Enders Island is an inhabited island located in Stonington, Connecticut, used as a Catholic retreat center, owned and operated by the Society of Saint Edmund. The island is connected to neighboring Mason's Island by a causeway, and Mason's island is connected to the mainland by another causeway. The island was called Munnawtawkit by the Pequot Indians. Adriaen Block, the first recorded European visitor, named it Vischer's Island in 1614 after one of his companions. For the next 25 years, it remained a wilderness, visited occasionally by Dutch traders. The best-known beaches include South Beach, Isabella Beach, and Chocomount Beach. In the CDP, the population was spread out with 21.8% under the age of 18, 2.1% from 18 to 24, 30.8% from 25 to 44, 27.3% from 45 to 64, and 18.0% who were 65 years of age or older. The median age was 43 years. For every 100 females, there were 105.0 males. For every 100 females age 18 and over, there were 98.2 males. 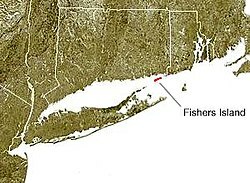 ^ a b "Geographic Identifiers: 2010 Demographic Profile Data (G001): Fishers Island CDP, New York". U.S. Census Bureau, American Factfinder. Retrieved 2012-12-28. ^ Haynes, Williams (1976). A Stonington Chronology. Essex, Conn.: Pequot Press. ISBN 0-87106-059-0. 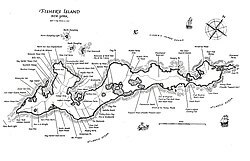 ^ "Elihu Island in New London County CT". Connecticut.hometownlocator.com. Retrieved 26 December 2014. ^ Bayles, Richard Mather (1874). 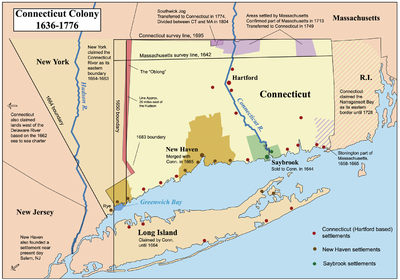 Sketches of Suffolk County, Historical and Descriptive, with a Historical Outline of Long Island. Books.google.ca. Retrieved 26 December 2014. ^ "General H. G. Wright - Life and Times". Spiderzweb.net. Retrieved 26 December 2014. ^ "Fishers Island Ferry website". Fiferry.com. Retrieved 26 December 2014. ^ "Report: Boys Basketball Game Schedule". Fisherisland.intand.com. Retrieved 26 December 2014. ^ "Fishers Island Waste Management District". Fishers Island Waste Management District. Retrieved 26 December 2014. ^ Jane Ahrens. "HLF Museum Files: G.B. Linderman Mansion". FishersIsland.net. Retrieved 26 December 2014. ^ "Golf - SBNation.com". SBNation.com. Retrieved 26 December 2014. ^ "Fishers Island Union Free School District". Education.com. Retrieved 26 December 2014. 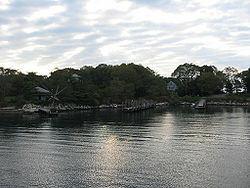 Wikimedia Commons has media related to Fishers Island, New York. "Fisher's Island" . New International Encyclopedia. 1905. This page was last edited on 26 February 2019, at 22:23 (UTC).